Landmarks are iconic construction that exist in a city based on its history. Then, its a heritage must be kept exist to remember the people of the past that involves in its construction. 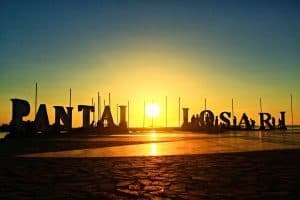 In each Indonesia province, there exist the most unique buildings regarded as tourist sites, Below are a few of the most famous Indonesian landmarks in the Indonesia province. If French has the Eiffel Tower as a landmark, provinces in Indonesia also have one alike. Truth to be told, in each province in Indonesia has a landmark. Few of those are very famous for unique forms. And this is why this place is regarded as a tourism attractions. National Monument is a landmark of Jakarta. 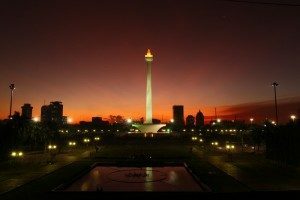 Its Situated right in the center of Jakarta, Monas is a magnet in attracting tourists who come to Jakarta to indulge in history. If you register, tourist can see slides that tell the history of Indonesia. Monas is a monument that symbolize the struggle of the Indonesian people. Situated in the center of Merdeka field, as part of which the fields have been used by Soekarno and Hatta as the place to held big rally. Both important person gather people’s power to repel invaders who will come back and seize power from the Indonesian government. On the other hand, you can also enjoy the atmosphere of Monas with the existing wagon ride around the park. This place is always crowded by residents of the capital on holidays. Thus also make this place as the favorite location to jogged on Sunday morning. Aside from becoming a landmark of Padang, the Clock Tower has also been regarded as a population area with the development of the park near the tower’s clock. The park turn into general area of space for people’s interaction on weekend and on off-day. Events of a public habitat are usually organized around a theme park located around the clock tower. Many tourists who felt incomplete when the vacation in West Sumatra and realize they have not visited the Clock Tower. Clock Tower was built without the use of iron buffer and cement. The mixture was only lime, egg whites, and white sand. Then, the Clock Tower has a ground-plan area of ​​13 x 5 meters. The inside of the clock towering 26 meters consists of several levels, with the top level is a storage place for a pendulum. The pendulum was broken once and had to be replaced because of an earthquake in 2007. There are four clocks each with a diameter of 80 cm at the Clock Tower. The clock are then brought directly from Rotterdam, Netherlands via the port of Teluk Bayur. Then its driven mechanically by the engine made only two in the world, namely the Clock Tower and Big Ben in London, England. Engine clocks and clock surface located at one level below the top level. At the bell parts there listed the company name that is Vortmann Relinghausen. 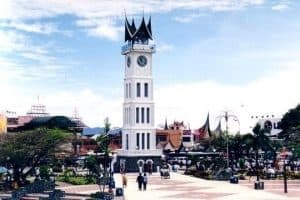 Travelers who come to enter into the clock entrance and see the inside of mechanism of an hour are pleased to see the inner working of the clock, you can walk around and shopping trinkets in typical West Sumatra Bukittinggi Market right in front of the Clock Tower. Sitting in the courtyard for hours while enjoying the cool air of Bukittinggi was also exciting. The idea to combine the two dry land in Palembang upstream and downstream with the bridge, actually existed during dutch rule in Palembang, 1906. When the post of Mayor of Palembang was held by Le Cocq de Ville, 1924, this idea was proposed again and was done a lot of struggle to make it happen. 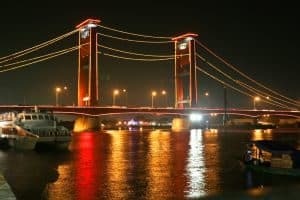 At the time after independence, the proposal ​​resurface then Big City Palembang Transitional Council suggested the development of the bridge during the time. Its called the Musi Bridge by referring the name of the past Musi River, at the joint hall session that took place on October 30, 1956. This proposal is actually classified as reckless because the existing budget in Palembang city will be initially assigned for the capital of only around Rp 30.000,00. Meanwhile, in 1957, a building committee was formed, consisting of Military Area Command IV / Sriwijaya, Harun Sohar, and Governor of South Sumatra, H.A. Bastari. Companion, Mayor of Palembang, M. Ali Amin, and Indra Caya. The team then proposed Bung Karno to support the plan. Development of the bridge began in April 1962, after acquiring the signature of the President. The budget of development is used from the Japanese war retribution budgets. Not only the budget, the bridge even use experts from Japanese engineer. Built from 1962 to 1965, the Ampera Bridge went on to become an icon of South Sumatra. The bridge is always crowded with visitors who want to enjoy the scenery and serenity of Palembang Musi River. The most fun time to come to this place is the night. At that time, the bridge will be illuminated by the glow of light from the decorated lamp. The Equator Monument is placed at Jalan Equator, North Pontianak, West Kalimantan Province. The location is about 3 km from the center of Pontianak, towards the city Mempawah. This monument became an icon of the city of Pontianak and flooded with tourist, especially people who arrive to the city of Pontianak. The background story of the construction of this monument can be found in the records inscribed in the building. a. The original monument erected in 1928 in the form of groupings of stone with arrows on top. b. 1930 the monument is perfected, shaping the milestone with circle and arrow. c. 1938 was reconstructed with development by architech Silaban. The real monument can be lurked on the internal building. d. in Year 1990, the Equator monument was repaired with the adding of the dome to cover the original monument and making backup monument with a volume five times larger than the original monument. The inauguration is on 22 September 1991. 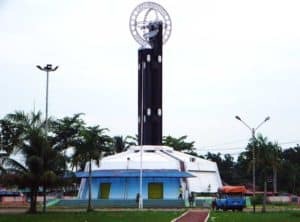 The Equator monument is a monument which is situated at the Equator, Pontianak, West Kalimantan. It is located about 3 km from the center of Pontianak to the City Mempawah. This monument is a marker of the passage of the equator in Indonesia. Then, thus it located right by the Equator, there are events attract visitors to arrive in this monument. The event is the culmination of the sun or a natural phenomenon when the sun was directly overhead. At that time, you will not be able to see your own shadow. The culminating event only happens twice a year, namely March 21 to 23 and 21 to 23 September. Gedung Sate, with its unique form of assortments grouped on the central tower, has many decades ago been landmarks in Bandung that is not just famous to the public in West Java, but to the entire Indonesia. Even the architecture of the construction was designated as a blueprint for some buildings and signs city in West java. Construction began in 1920, the white colored building is still existing firmly and now acts as a center of government administration in West Java. 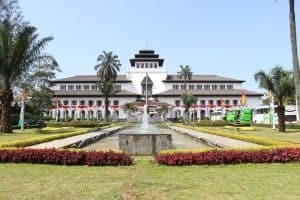 Gedung Sate is a special building, but it is also a government office buildings in West Java. On holiday, this place of Gedung Sate Bandung has become a place for most people to have their fun time. 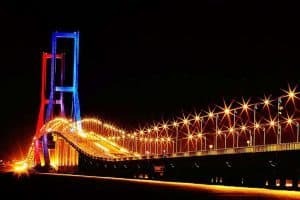 Suramadu bridge is a bridge that spanned the Madura Strait, linking the island of Java (Surabaya) and Madura (Bangkalan, exactly the eastern Kamal), Indonesia. With a length of 5439 m, this bridge is the most lengthened bridge in Indonesia nowadays. Suramadu bridge consists of three fragments, that is the overpass, approach bridge, and the main bridge. The bridge was erected at the beginning of its development by then President Megawati Sukarnoputri on August 21, 2003. Its opening was enacted by then President Susilo Bambang Yudhoyono on June 11, 2009. Development of the bridge has purpose to accelerate growth in Madura Island, covering the infrastructure and economy in Madura, which is somewhat stalled in relation to other areas in East Java province. Estimated budget of development of this bridge is 4.6 trillion rupiahs. Suramadu bridge is basically a combination of three types of bridges with a total length of 5439 meters long with a width of approximately 30 meters. This bridge provides four-lane two-way with two 3.6 m wide emergency lane width of 3 meters. The bridge is also providing special lanes for motorcyclists on each outer side of the bridge. Meanwhile, with the construction of this bridge, the government hopes to improve the distribution of income in the region Surabaya to Madura, as well as the population, given the Surabaya region is increasingly crowded with people who largely come from Madura, the government hopes that the economic equality there can reduce the rate of urbanization. Heroes Monument is a monument that turns into an icon of Surabaya. The monument height is 41.17 meters and inverted spikes. Building monument formed like 10 arches, and is turn into 11 segmented part. The tall segments of arches meaning the date of 10th, in 11th month, 1945. A historic date, not only for the people of Surabaya, but intended for many others Indonesian people who were colonized by the dutch. Heroes Monument was erected to remember the events of 11 November 1945 in the War of Surabaya. Its where Arek-Arek Suroboyo battle against the European troops who along with the Netherlands wanted to colonize Indonesia again after Japanese defeat in world war II . Heroes Monument became the center of attention every November 10 in memory of the events in 1945 when many of the fallen heroes in the war of independence. 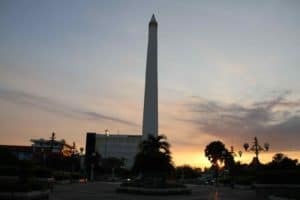 There are two opinions as to who is the initiator, as well as architects of the monument located in Pahlawan Surabaya street. According to Billy Barnowo, the monument was initiated by Arnowo Doel, who was then serving as head of a large city of Surabaya. Then, he asked Ir. Tan to design the image of the monument that is meant to further submitted to the President Soekarno. Although, based on Ir. Soendjasmono account, the idea of this monument come from Ir. Sukarno. The idea get special treatment from the Mayor of Surabaya. For making the blueprints and its architect was submitted to Ir. R. Soeratmoko, who beat out several other architecture in the competition for the selection of an architect to build this monument. Losari Beach is a beach stragically laid on the west part of the city of Makassar, South Sulawesi province, Indonesia. The beach is a location for people of Makassar to use their time in the morning, afternoon and evening watching the sunsets that were very precious. In the past, this beach is known as the center of seafood and grilled fish at night because the shoppers operate only at nighttime, and is regarded as the longest shop in the world as shop tents erected along the coastline with a length less over a kilometer. Currently many restaurant providing seafood has been migrated to a location near the office of Mayor of Makassar, where is located strategically near Losari. Monument Simpang Lima Gumul or normally referred to as SLG is one of the unique monument of Kediri. SLG was erected in 2003 and officiated in 2008, which was inaugurated by then Regent of Kediri, Sutrisno. The building is located in the village Tugurejo, District Ngasem, Kediri, East Java, precisely in the center of the meeting of five road leading to Gampengrejo, Capping, Pare, and Plosoklaten Pesantren, Kediri. 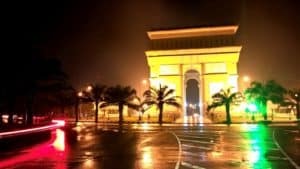 Then, in SLG, there are no official explanation as to why and for whom Simpang Lima Gumul Kediri monument was erected for. Some people said that the construction of this monument was in part because of Jongko Jojoboyo, king of Kediri Kingdom in 12th century who wanted to unite the five regions in Kediri. Beside from being a unique place of the city, currently SLG also turning into a place of economic and new trade in Kediri, which is thought to make the livelihood of people there grow significantly in Kediri. Monument Simpang Lima Gumul are placed in a crowded area and is filled with assortments of public facilities. Such as conference hall, a multipurpose building, regional Bank areas, terminal inter-city bus and Passenger Car station. Then, the market is temporary and open on certain times Saturday-Sunday and recreational facilities such as water attractions named Water Park Gumul Paradise Island. From the western end of Indonesia in Aceh there were a landmark called Baiturrahman Mosque that existed in the province. This mosque has existed since the 1880s and is located in the center of the city of Banda Aceh. Although its primary function is as a place of worship, the mosque was always full of tourists visit. Baiturrahman Mosque has an area of 4 hectares and can accommodate about 10 thousand worshipers. This Mosque had seven domes and has a large yard and a pool. The mosque was still standing strong even when the tsunami hit Aceh devastatingly in 2004. Baiturrahman Grand Mosque in Banda Aceh has been renovated. It looks like the Mosque in Medina, the yard is now replaced with the marble and added 12 giant umbrellas near surrounding. Even though not yet fully ready, the presence of electric umbrella has become an attraction for tourists. Selfies photo near that place with the background of the mosque began scattering on social media. Residents around Banda Aceh makes this location as a new tourist attraction. Late in the afternoon or during the day, some umbrellas are allowed to expand. Work on the construction of landscape and infrastructure currently reaches 90 percent. 12 units umbrellas and marble floors have been installed. A pool is built in the front yard to enhance to look of the mosque that is pride and joy for the people of Aceh. Tanah lot is located in Bali, Bali is famous by the beaches and the beautiful resorts, so Bali is well known throughout the world, and in Bali, there exist various Hindu temples as the landmark of this paradise city and in it contained in Tanah Lot. The temple was built in two different places. One temple is situated on top of a large boulder, and the other is located at the top of the cliff that laid into the sea like the Uluwatu Temple. This slope is what connects the temple with the mainland. As well as the slope shaped like a bridge. 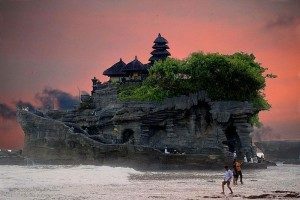 Tanah Lot temple is part of the universal heaven in Bali, it is intended as a place to worship god of the sea creatures. At the time of high seas tide, the temple will be seen flooded by sea water. Below the temple lay a narrow cave in which there are few slimy creatures swarming the places. Lawang sewu means in English is thousand doors. aptly called thousand doors, because this landmark building has many doors in it. Then, it was built during the Dutch colonial rule as the residence of the Dutch Government administration. 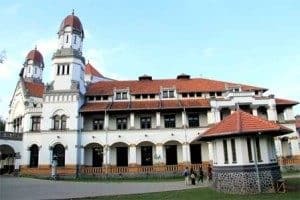 Now, Lawang Sewu has been the main tourism magnet for Semarang. In the beginning this building was belong to the railway company headquarters of Dutch east Indies, Nederlandsch Indishe Spoorweg Naatschappij. Perhaps because of the architect’s obsession with the door. Then, the building’s two wings have a lot of doors. Suspected as many as 429 doors in Lawang Sewu with doors reaching one thousand two hundred parts because most door design uses four doors. The early days of Lawang Sewu also was used as a place to stay for Dutch railway department officials. Which later in the Japanese colonial era, the building was converted as a prison. On the other hand, in Post-independence, the Republic of Indonesia tried to restore the function Lawang Sewu as the headquarters of the national train company, but now its function has been turned into a museum. 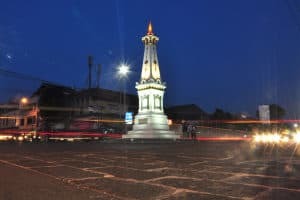 Yogyakarta monument or better known as the Tugu Malioboro is a marker of the northern boundary of the old city of Yogyakarta. Yogya monument is not just any monument, but the monument is a monument of Yogya that has a very historical myths and many mystery in it, so it becomes one of unique property in the city of Yogyakarta. This is highly regarded monument and embody many philosophies in inscription. This monument has been located there for 300 years and also a monument of this magnitude is the symbol of the unity of the King and His own people. The idea to erect this monument was brought by Colonel Sugiarto, as the mayor of the municipality of Yogyakarta in the anniversary of Yogyakarta that was organized the Regional Government of Yogyakarta on June 29, 1983. The name was chosen with the intention of Yogya historical events marker during the withdrawal of dutch occupying forces from the capital of the Yogyakarta on June 29, 1949. This was an early sign to the independent of Indonesia from the Dutch government authority. The name comes from the words sura and buaya. Sura means sharks and buaya means crocodiles, this statue is the classic landmark of Surabaya. The statue is located on Jl Diponegoro. 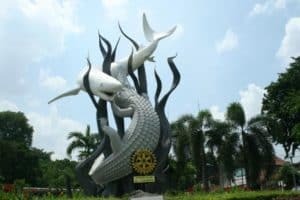 Then, this statue symbol of the city of Surabaya is in the form of sharks and crocodiles who were fighting. We can see this symbol of the city of Surabaya in the form of a statue in front of the Surabaya zoo. Shark (Sura) ruler of the seas and the Crocodile (Baya) ruler of the river. Both animals portrayed here were fighting to compete for the territory. Those, in the end both these aquatic animals equally dies in vain, and the location where the animal was found dead is called SURABAYA. Borobudur is a Buddhist temple located at Borobudur, Magelang, Central Java, Indonesia. The Stupa shaped temple was founded by the Buddhists around the year 900 SM during the rule of the Buddhist dynasty. Borobudur is the enormous Buddhist shrine throughout the world. Many historian estimated that Borobudur was founded around 800 BC. This estimation is based on the discovery of the existence of a short article. On the other hand, its engraved on the original frame foot attached in temple reliefs (Karwa Wibhangga). This inscription uses the Pallava letters that identified to be used in the 8th century AD. Then, this estimate is further strengthened by the discovery of evidence related to the suitability of the history of Indonesia in general. 8th century AD is known to be the golden century for Wangsa dynasty Buddhist kingdom. 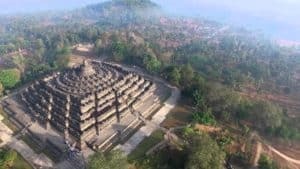 Many researchers encountered small temples that were found in the foot and mountain slopes around the Borobudur temples that were later identified as a relic from Sailendra dynasty which was also the house of the follower of Mahayana Buddhism. Well, based on that evidence, then come the conclusion that the origin of Borobudur was built by the Sailendra dynasty in 800 AD century. Landmark is used to differentiate each city with one another and to also make each province unique in terms of its culture and history. Visiting all of the landmark in Indonesia would be your precious life’s goal.